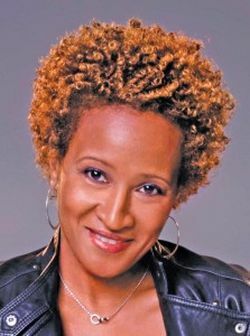 Wanda Sykes is an American actress, comedian, writer, and voice artist. She is best known for her recurring role as Barbara Baran on the CBS primetime show The New Adventures of Old Christine, and for her comedic roles in such films as Monster-in-Law and My Super Ex-Girlfriend. Sykes is the daughter of Marion Louise, a retired banker, and Harry Ellsworth Sykes, a retired U.S. Army colonel. She was born in Portsmouth, Virginia on March 7, 1964, but raised in the Washington, D.C. area. Sykes attended Arundel High School in Gambrills, Maryland, and later Hampton University, where she pledged Alpha Kappa Alpha Sorority and graduated in 1986 with a bachelor’s degree in marketing. Upon graduation, she worked as a procurement officer for the National Security Agency (NSA) but soon realized she wanted to become an entertainer. In 1987, at the age of 23, Sykes took to the stage for the first time in a talent show in Washington. While she did not win the contest, she honed her stand-up skills at various comedy clubs while retaining her position at NSA. In 1992, Sykes relocated to New York to work the comedy circuit and soon got her first big break by being selected as the opening act for comedian Chris Rock at Caroline’s Comedy Club. In 1997, she joined The Chris Rock Show as a writer, made guest appearances, and won an Emmy Award for her writing in 1999. Other television appearances followed. She hosted the 2002-2003 season of Comedy Central’s Premium Blend and had recurring roles on The Drew Carey Show and Curb Your Enthusiasm. She was a skit comedian on Inside the NFL, an HBO series for which she won Emmy Awards in 2002 and 2004. Sykes made her film debut in a supporting role in Tomorrow Night in 1998 and starred in Pootie Tang and Down to Earth in 2001. She has been a voice artist in Over the Hedge, a 2006 film, and Ice Age: Continental Drift, a 3-D computer-animated comedy adventure film in 2012. Sykes married record producer David Hall in 1992, but the couple divorced in 1998. In 2008, she announced to the world that she was a lesbian and was married to her French-born partner, Alexandra. In 2009, their children, Olivia Lou and Lucas Claude (twins), were born. Since coming out, she has become active in the gay rights movement. In 2005, Sykes released her autobiography, Yeah, I Said It. Four years later, in 2009, she became the first African American woman and first openly gay person to be the featured entertainer for the annual White House Correspondents’ Association Dinner. Wanda Sykes and her family live in Los Angeles, California. Linda Rapp and Wanda Sykes, eds., An Encyclopedia of Gay, Lesbian, Bisexual, Transgender, and Queer Culture (Chicago: GLBTQ, Inc., 2011), retrieved from ww.glbtq.com/social-sciences/sykes_l.html; Lawrence Ferber, Wanda Sykes: Being Herself (Chicago: Windy City Media Group, 2009).